After swiping at his iPhone to zoom in on the training script sent by Tampa Bay’s strength and conditioning coach, Buccaneers punter Michael Koenen starts in on the free-weight dumbbell bench. He starts light. Soon, though, the 10-year NFL veteran is lifting 95 pounds. Per arm. Then 110. And 120. The weight rack didn’t have anything heavier. While Koenen may be no Brad Weatherford—“He’s yoked, says Koenen in admiration”—the punter has muscles far beyond his booming right leg. Indeed, while his livelihood may rest on his kicking leg, Koenen works his upper body plenty hard too, falling in line with the same exact workout script sent to every Tampa Bay player weekly in the offseason. But he also takes care of that leg. Starting off an early weekday workout—so Koenen can get home in time to eat breakfast with his family—with a bike warmup at The Locker Room gym in Ferndale, Wash., the gym he co-owns with fellow Ferndale High alum and former NFL quarterback Jake Locker, Koenen says training for the NFL year is about seasons. “The team does a good job of breaking down each time of year,” the 32-year-old says while clad in full Tampa swag. In the summer, you’re building and making sure you improve upon your spring work, leading into the intense pre-season camps. 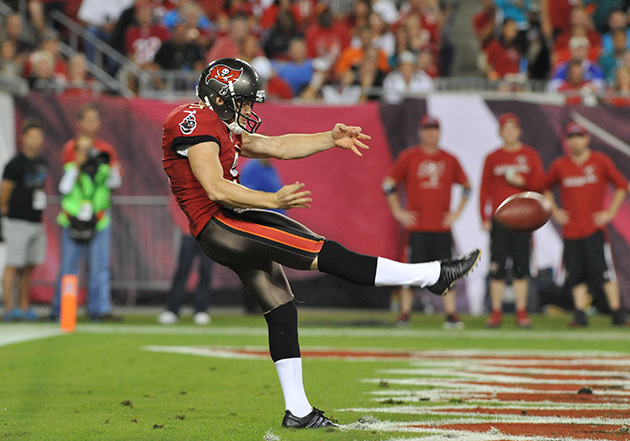 ​Kicking remains a part of his summer routine, but the focus stays on weights. He wants to balance his leg muscles, not letting that all-important right leg throw him off. He’ll do plenty of kicking in training camp too, so he puts a focus on his left side in the spring and summer to get everything equal. For summer, he’ll hit the weight room four days a week in the morning, handle some yoga two days, and kick on three or four afternoons—Koenen owns a beef farm outside of Lynden, Wash., and enlists the help of his kids to shag kicks for him in the spacious field, even if they’ve learned not to try and catch the booming balls. He makes sure to continue his all-important stretching routine pre- and post-kicking. During the off-season he’ll strike 40 to 50 balls a day, working on everything from hang time to distance to location. During training camp, that number usually falls to around 30. ​Now the father of five eats gluten free and doesn’t eat sugar, with his “cheat” peanut butter on apples. “I’m a businessman and my body is my tool, so I have to take care and get it in the right place,” he says. When his career started, he was simply eager to find his spot in the league, so excited for the opportunity. But he started to glean ideas and wisdom from older kickers—Jason Elam, among others—to help him focus on longevity. One recent small change, for example, has Koenen wearing compression tights whenever he trains, something he found a few years ago did help him with circulation and recovery. For Koenen specifically, working his abs prove a major part of his focus. He also wants to get in tons of squats to work his glutes and power through gobs of lunges. He loves anything that works his hip flexer and is always stretching his hamstrings and quads, something he’s started doing more and more as his career evolved. “You need to build muscles in a balanced way,” he advises. “You rely on your body and how you trained and you need your muscles to be there. You have to focus on coming through fast and strong. And it fills out a jersey quite well.